In the latest version of portfolio online we’ve made a number of improvements that we hope will improve your experience. In this release we’ve been focusing on improving layout of user interface and making more information available in order to reduce the number of pages you have to navigate. The portfolio card is a quick snapshot of the portfolio. It still has the “coverage summary” bar that shows curriculum coverage for the current folder. Now you can also see current placement details too. We’ll also highlight missing information to help ensure everything is up to date. For example clicking on ‘details’ allows you to see information without having to navigate into the portfolio itself. And the ARCP gives a quick heads up on previous/scheduled ARCP. We’ve got more planned for this particular pane so watch this space! The Portfolio Overview page has been entirely redesigned to make it much clearer where you are in the system, and make it more consistent with other screens. Folders have now been given their own tab in the portfolio to make it easier to view and manage them. You can view coverage and post details across all of your training levels in one place. These structural changes in the site layout also pave the way for a new “Progress to CCT” view which is under development. This will start to aggregate all the requirements for ARCP in one central location so that any gaps can be easily identified. 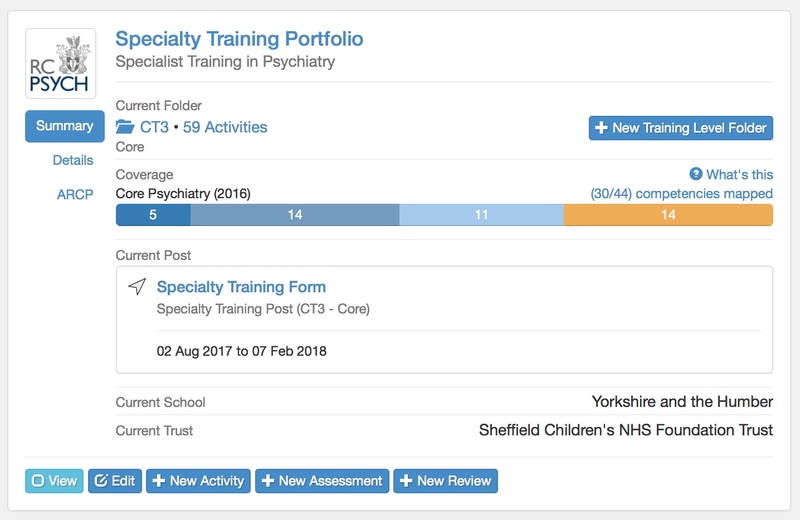 In conjunction with Curriculum Coverage this will provide trainees, supervisors, ARCP panels easy access to the core information they need to to formulate future training needs, and evaluate progress. When searching for activities, assessments or reviews the results now contain much more detail about the activity, which should again reduce the need to click into the activity itself to see information. We are always seeking to improve usability by reviewing what information is displayed where in the system and how users search and filter portfolio contents. So please continue to submit suggestions to help us deliver the features that you want.